A Cornish accountancy firm is not letting fears of a recession hold it back after expanding for the second time in as many years. Truro firm, MurphyGriffett has recently announced a merger with longstanding St.Austell practice, Eric Wills and Co taking the group of Partners to four. 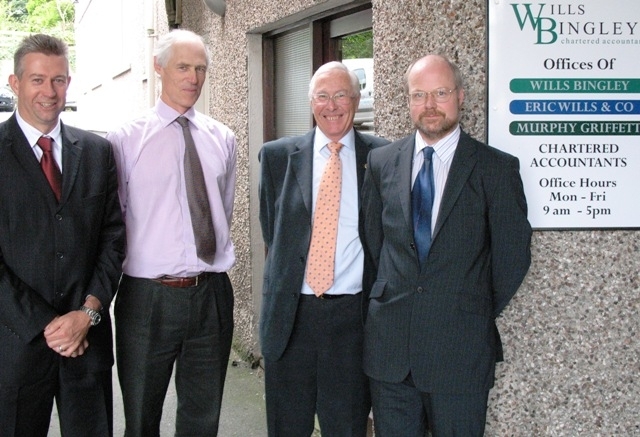 The move followed an earlier merger between the Truro firm and Chartered accountant Giles Bingley from Grampound. The new combined group will trade as Wills Bingley and all operations have moved into the Eric Wills offices on East Hill in St.Austell. “The ongoing redevelopment of the St.Austell town centre makes the central location of the Eric Wills’ offices ideal for covering our clientbase, which covers the length and breadth of the county as well as a growing clientbase out of the county and in London. The four partners in the firm are Giles Bingley, Eric Wills, Paul Smith and Jonathan Wood. Two are Chartered Accountants (FCA’s) and two are Chartered Certified Accountants (FCCA’s). Each partner will lead a team of qualified and dedicated staff. Both Giles Bingley and Jonathan Wood trained with large London firms and worked in senior roles outside the profession before returning to Cornwall. Eric Wills and Co has been trading for some 45 years.